Wednesday night I returned to Hollywood to provide bartending service for a holiday party of a very successful production company. I did the bar catering last year and was very happy to return. I brought another bartender with me and we served approximately 250 thirsty people. I set up two portable bars side by side and we went to town slinging drinks. The hosts requested a specialty drink that required rosemary simple syrup. I volunteered to make the simple syrup, because I like the challenge of doing that. I can infuse almost any herb, fruit, or vegetable into simple syrup, and have done cucumber, peppercorn, ginger, and now rosemary. The drink they created was called the 1936 Cocktail and it consisted of Tito’s vodka, grapefruit juice, rosemary simple syrup, and dash of club soda. The drink was a big hit. Papa Christo’s of Los Angeles provided the catering and they put out some excellent Greek food for the hungry partiers. We also served four different beers, red and white wines and various mixed drinks. I had helped the host with a shopping list and we went through most of it by the end. This holiday season I have had to hire more bartenders to help out with the demand. Every year in December there are always parties on Friday and Saturday nights, and more during the week, especially during the first three weeks of the month. Luckily, I have been able to accommodate all of me good customers. So far, I am still available for New Year’s Eve – the last holiday party of the year. Call me today! Please follow us on Facebook if you haven’t done so already. Shaken Not Stirred, the LA mobile bartender service did three big events last weekend. On Friday night I traveled to my old home in the South Bay to do a cocktail party that was hired for at the last minute. On Saturday, I drove to Lancaster to bartend a wedding party that I booked months ago, and on Sunday I jammed down to Hollywood to bartend a birthday party. It was a great weekend for making drinks. The Manhattan Beach party was held at a nice home on Ardmore Street that winds through the center of the beach community. If you have never visited Manhattan Beach, I urge you to do so, because it is a true gem of Los Angeles. The party was an anniversary of sorts – it marked the day that the host was paralyzed from the waste down in a freak diving accident. He told me about it and I realized how lucky I have been, because that could have happened to me a dozen times over, in the ocean, and in swimming pools. Probably 50 or 60 people showed up for the party and I made simple vodka drinks. It was a great party and I was so glad they hired me. Hopefully I will do it again next year. On Saturday, I drove out to Lancaster to bartend the wedding party at the Lancaster Museum of Art and History. It is a very nice venue and they have an event space on the roof perfect for weddings. At some point during the planning, the bride and groom decided to only serve wine and non alcoholic drinks for the wedding reception. They didn’t even serve beer. I had about five different types of wine, and as I have said many times – people will drink what is available, even if they prefer something else. I will admit that by serving wine only, it cut down on the level of drunkenness, and everyone seemed to have a good time. On Sunday, I drove to Hollywood to bartend a man’s birthday. He had a similar reason for celebrating as the man in Manhattan Beach. He told me that he had almost died of kidney failure three years ago, and tries to do something special each year on his birthday as a survivor. It was a small party in his apartment that was attended by mostly family members, and I tried to be of service as much as I could. This weekend I will be doing two parties – one in the South Bay again, in Lomita, and then on Sunday I am driving all the way to San Diego to bartend a birthday party. The LA mobile bartender, Shaken Not Stirred covers all of Southern California, from the mountains to the sea. This weekend, Shaken not Stirred provided bartending services at two Coachella Valley events. On Friday night, I traveled to Indio to bartend a wedding rehearsal dinner, and then on Saturday I bartended a backyard wedding in Palm Springs. I really like doing these parties in the Palm Springs area, because many of these rental houses have very nice backyard bars, and that was the case at both of these events. The house in Indio was just blocks away from where the annual music festival at Coachella is held. It had a very nice backyard bar. I was serving to 150 people by myself. The way that was done is that I made a big batch of margaritas and set it out in a beverage dispenser, along with ice, limes, cups and oranges, and the guests self served. They also self served beer. I made a few other cocktails and it worked out great. I will remember that, when somebody wants one bartender for a large group like that. The future groom was from Maine, and many of his family members had traveled all the way across the country to attend the wedding. For them, the weather in Palm Springs was a treat. It is always nice meeting people from different parts of the world and country. Everyone has their different tradtions when it comes to cocktails. 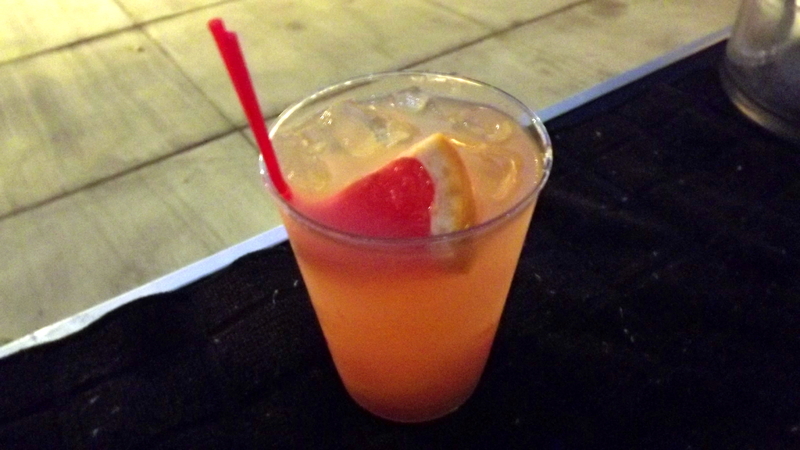 In this case – the Maine Margarita featured tequila, margarita mix, fresh oranges, and Coors Light. 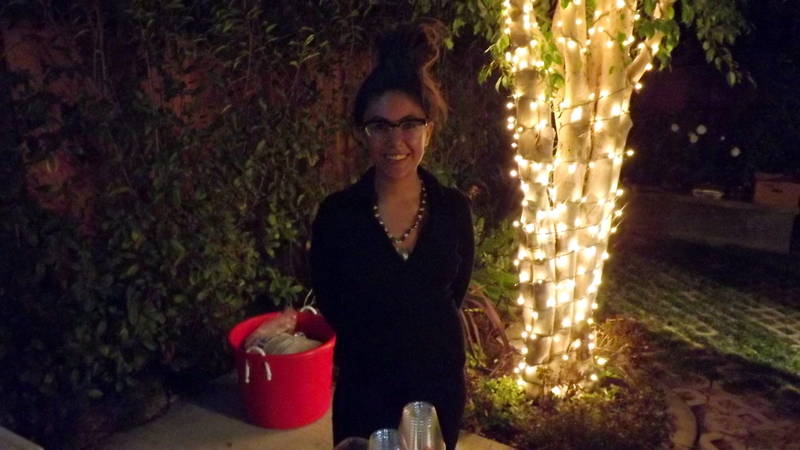 On Saturday, I went to a house in Palm Springs to bartend the backyard wedding. Many of these guests had either traveled from Phoenix or Oregon to attend. This was a smaller group of 60 people , which is the perfect size for one bartender. I made Moscow Mules, and Old Fashioneds. Goodfella’s Tacos provided catering, and that was the second time in a month I ran in top them. I must say, their fish tacos are out of this world. I have a new Palm Springs Yelp page and I need to get some reviews on there from my Coachella Valley events. Today the Academy Awards take place in Hollywood. I have bartended Oscar parties before, but have nothing booked for today. If something comes up last minute, I will do it. Next weekend I am going to Santa Clarita to bartend a 60th birthday party with a James Bond them, and then the following weekend will be doing two events in Santa Barbara. Last night Shaken Not Stirred was the bartending company of choice for a Hollywood holiday party with over 200 guests. I was the bartender and my daughter Pia, was my barback. We served out of almost everything by the time the night was over. 200 people can drink a lot of alcohol, even on a week night! 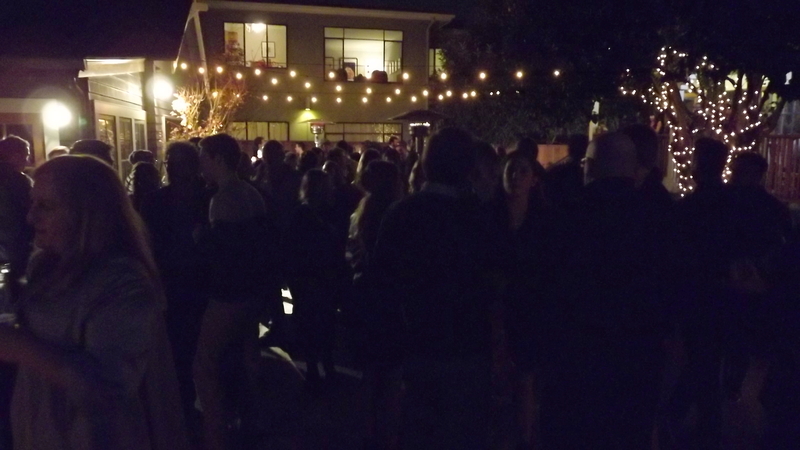 The party was put on by a Hollywood production company for friends, employees, and associates. We set up our portable bar and table in the back yard. The weather is still warm enough in southern California to have outdoor parties. A catering company, Sky’s Gourmet Tacos provided the food, and they made some excellent tacos. The food line kept going all night, as did the drink line. The specialty drink of the night was the Paloma. The Paloma is a classic Mexican favorite and is made different ways. Some people just use Squirt, lime and tequila, others use Fresca and tequila. Last night we made the Paloma with tequila, sparkling grapefruit juice, and fresh lime, with a sugar rim and grapefruit wedge garnish. It was a big hit and we served completely out of it. I taught my daughter how to make that drink and she made some other simple ones, like gin and tonics, rum and Coke, or Vodka and cranberry. I have taught many people to bartend over the years, and some of them are still making a living at it. I say time and time again, it ain’t brain surgery! It does require some grace under pressure however, that some people just can’t bare. 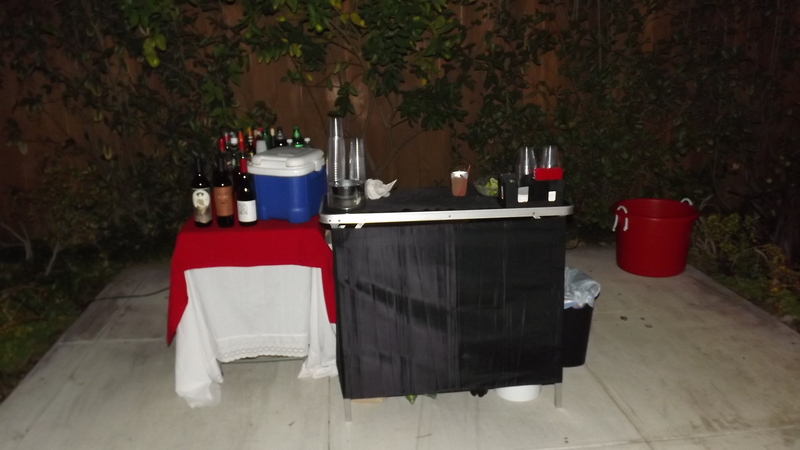 On Saturday I will travel to the city of San Gabriel to bartend another holiday party, and then on Sunday I will do another one for a repeat client, who has a fantastic back yard bar in the city of Villa Park in Orange County. Then next week, I have four back to back Christmas parties, all around the San Fernando Valley. This is going to be a great month for Shaken Not Stirred, but I am a bit worried about next month, as it could slow down after the busy holiday season. I have two events booked so far in January, so I will be anxious to fill that calendar up – knowing that it will invariably be slower. I will take that time to refocus my marketing efforts.